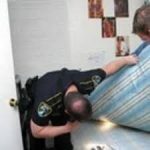 After a bullet was fired through Hick’s aparement, the police lawfully entered the apartment without a warrant to investigate (warrantless entry was lawful due to the exigent circumstances). While inside the apartment, an officer observed expensive stareo equipment that seemed out of place. The officer moved the eqiupment to access the serial number from which he determined that the equipment was stolen property. The Suprem Court determined that the “plain view doctrine” was inapplicable and the search was unlawful. When the officer saw the stereo equipment in plain view, it only seemed out of place and he did not have probable cause to believe that the equipment was stolen. It was only after the officer moved the equipment to read the serial number did he determine that the equipment was stolen. The serial number was not in plain view and, therefore, the moving of the stereo equipment consitituted a new search that was not supported by probable cause.